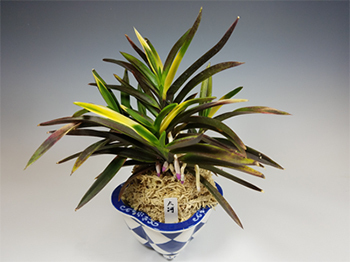 When I decided to get a special pot for my Neofinetia 'Taiga', I knew immediately that I wanted Carol Beule to make it for me. I had a very specific idea of what color scheme I was looking for - based on an old Japanese pattern. I also knew the size pot that I wanted. Carol offered a number of possible pot shapes, and we settled on one. Once the pot was made, Carol started the painting process, sharing photos and asking for my input all along the way. When I was happy with the painting, Carol did the final firing. The process was easy, and Carol kept me well informed of my options as she worked. 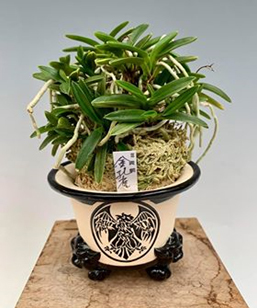 I was fortunate to win best plant at the 2018 American Fukiran Society meeting in Santa Barbara, CA with my Taiga. In my opinion, the recognition was due, in no small part, to the pot Carol made me. I cannot adequately express how delighted I am with my Carol Beule pot. It is a true work of art, exquisitely matched to my special plant. My daughter Cecile, gave me three Carol Helen Beule pot creations as an advance birthday gift last July. Beautiful pots. I love all of them. I love that everyone of them is a unique and one of a kind creation. 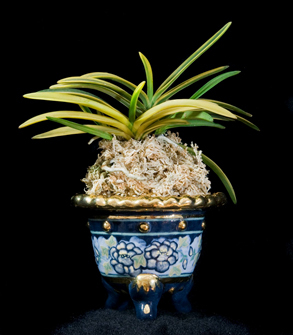 No two pots are alike, there is always something different. I’m hoping to get some more of her beautiful pots. (In English) I asked Carol to do an elegant Fuuran pot for me. During the process, she regularly sent me pictures of her work and asked often about my preferences, giving me some options about the final look of the pot. She did not disappoint me! 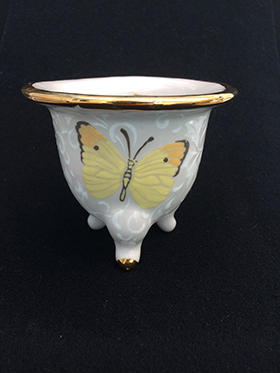 When I received the pot, I was stunned by the beautiful details of this work of art. Anyone looking for unique pots should ask Carol. She is quite an artist. (In French) J’ai demandé à Carol de concevoir un pot pour mes Noefinetia (Fuuran). Elle m’a tenue informée tout au long du processus et elle me proposait aussi de temps à autres des variantes concernant l’apparence finale. Je n’ai pas du tout été déçue! Lorsque j’ai reçu le pot, j’ai été étonnée par la beauté des détails de cette œuvre d’art. Quiconque est à la recherche d’un pot unique en son genre devrait contacter Carol. Cette femme est une véritable artiste. Carol is a master at her craft! Each Nishikibachi is a work of art. Carol has an eye for both beauty and detail! I am very honored to have one of her pots in collection.